Tara M. Raghavan is a partner at Rakoczy Molino Mazzochi Siwik LLP. Her practice focuses on complex patent litigation, counseling, and opinion work, particularly relating to the Hatch-Waxman Amendments to the Food, Drug and Cosmetic Act. Ms. Raghavan’s litigation practice focuses on patent infringement lawsuits. Ms. Raghavan has extensive experience in all facets of patent litigation, including pre-suit strategy development, fact and expert discovery, the pre-trial and trial phases of federal litigation, as well as experience at the federal appellate level. Ms. Raghavan was a key member of the team that secured a victory at the District Court and Federal Circuit levels, not only defeating a preliminary injunction motion but also invalidating two patents upon summary judgment relating to the drug Boniva® (ibandronate). Ms. Raghavan was also a member of the trial team that secured an invalidity ruling with respect to a patent related to the drug Pulmicort Respules® (budesonide); this ruling was affirmed at the Federal Circuit. Ms. Raghavan was further an integral member of the team that secured a Federal Circuit en banc ruling affirming summary judgment of non-infringement involving the drug Omnicef® (cefdinir). Ms. Raghavan was also a member of the team that defeated a motion for temporary restraining order and preliminary injunction involving the drug Altace® (ramipril). Ms. Raghavan has further participated in patent litigation involving such drugs as Tricor® (fenofibrate), Namenda® (memantine), Trilipix® (fenofibrate), and Sprycel® (dasatinib); each of these cases was resolved by settlement on favorable terms for RMMS clients. Ms. Raghavan has prepared scores of opinions of counsel for clients on a variety of intellectual property issues, including non-infringement opinions and invalidity opinions on patents covering pharmaceutical drugs, as well as legal opinions and memoranda on other various subject matter, including the Safe Harbor provision associated with the Hatch-Waxman Amendments to the Food, Drug and Cosmetic Act. Ms. Raghavan has also counseled clients regarding the scope of marketability for their products in view of the relevant patent landscape. Furthermore, Ms. Raghavan has been involved with the firm’s due-diligence relating to an array of pharmaceutical products. Ms. Raghavan is registered to practice before the United States Patent and Trademark Office and has had significant experience preparing and prosecuting patents. The technological fields with which Ms. Raghavan has experience include such diverse areas as the mechanical arts (including medical devices), business methods and systems, the chemical arts (both organic and inorganic, including polymers and hydrogen fuel reforming methods), and pharmaceuticals. 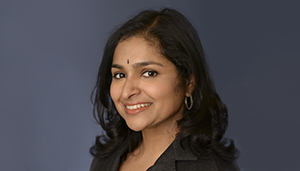 Prior to joining Rakoczy Molino Mazzochi Siwik LLP, Ms. Raghavan worked on patent prosecution, trademark litigation, trademark prosecution, and copyright prosecution matters at Denison & Associates in Chicago. Prior to attending law school, Ms. Raghavan worked as an organic chemistry intern for Stat Analysis (Hi Tek Environmental), an environmental testing firm in Chicago’s Technology Park, where she prepared soil samples for chlorine and CFC analysis. She also served as a Research Assistant for the University of Illinois at Chicago Economics Department. In that capacity, Ms. Raghavan helped to organize Emissions Trading conferences at the Federal Reserve Bank in Chicago and edit conference volumes. In Fear of Cyberterrorism: An Analysis of the Congressional Response, 2003 University of Illinois Journal of Law Technology & Policy, 297-312. Co-author (with Jeff Kowalski and Brad Lyerla), Things to Think About When Drafting Patent Licenses, Understanding the Intellectual Property License 2001, Practising Law Institute.